Comptroller Peter Franchot was elected to serve as Maryland's 33rd State Comptroller on November 7, 2006. Prior to his election to statewide office, Peter served as a Delegate from Montgomery County for 20 years. During his time in the House of Delegates, he was a member of the Appropriations Committee, and served as the Chair of its Transportation & the Environment Subcommittee. Using this experience and expertise, Peter has pledged as Comptroller to be a strong fiscal watchdog for Maryland taxpayers and an independent voice on the Board of Public Works. 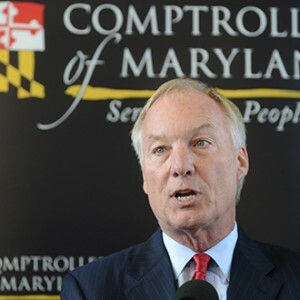 Comptroller Franchot’s dedication to Maryland was recognized in 2010 and 2014 when he was overwhelmingly reelected his second and third terms.